This is the installation package needed, so you don't have to unpack this .zip file. You can continue with installation process. Step 3 - Click the Upload File & Install button. Congratulations! 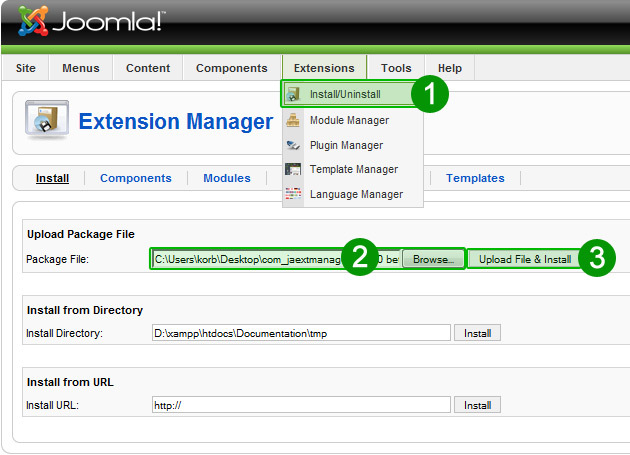 Now you have installed the most powerful tool you have ever used in your Joomla! powered website! JA Extensions Manager is quite capable to upgrade itself. It only holds a database table with logs on each extension upgraded using the component. The developers took care of it's XML file so you don't have to deal with these upgrade steps described here. Step 3 - upload the new version installation file to the repository and click the Cancel button when the upload is complete. Step 5 - click the Upgrade link to start processing the upgrade. You will have to add a suggestive comment for the upgrade. Example: "Upgrade 1.0.0 Beta to 1.5.0 Stable". Good! Now you have the latest version of JA Extensions Manager! You have to refresh component page to load the new version.